LONDON, April 2, 2019 /PRNewswire/ -- Nintex, the global standard for process management and automation, today announced that CRN®, a brand of The Channel Company, has awarded Nintex with a 5-Star rating in its 2019 Partner Program Guide. Nintex's global partner program accelerates business for channel partners who, in turn, delight customers with powerful and easy-to-use process management and automation solutions that leverage the entire Nintex Platform. 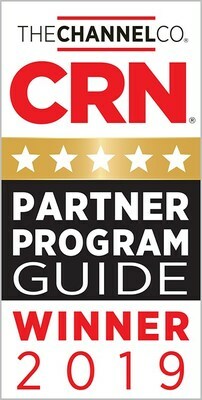 The 2019 Partner Program Guide, featured in the April issue of CRN and online at www.CRN.com/ppg, identifies the strongest and most successful partner programs in the channel today, offered by the top technology suppliers for IT products and services. The 5-Star rating recognises an elite subset of companies that offer solution providers the best partnering elements in their channel programs. "Nintex is very committed to the success of our partners and customers," said Nintex CEO Eric Johnson. "Our business thrives because of the work our channel partners do every day with the Nintex Platform. Our customers benefit greatly from the industry knowledge and expertise of our partners who build process apps faster than custom code with Nintex, the industry's most complete platform for managing, automating and optimising business processes." Nintex partners play a critical role in the ongoing success of the global Nintex Community. The company's partner model helps Nintex continuously innovate and expand its product offerings including the latest additions of Nintex Promapp™, Nintex Sign™ powered by Adobe Sign, and Nintex Foxtrot RPA, while its vast partner network helps Nintex customers solve their process problems and accelerate business outcomes. "With new technologies emerging every year, evaluating which IT vendors to partner with grows increasingly more complex for solution providers," said The Channel Company CEO Bob Skelley. "We are proud the CRN Partner Program Guide has become the trusted resource to identify the most rewarding partner programs and provides crucial insight into their strengths and benefits for the channel." Nintex's partner program offers comprehensive support and resources including pre-sales assistance, co-funded marketing campaigns, demonstration environments, technical training, sales training, referrals, an online partner portal, and more. The program is championed by Nintex Senior Director Joe Peterson and his team. Peterson was recognised by CRN in February as a 2019 Channel Chief. To learn more about the Nintex Partner Network visit https://www.nintex.com/partner-overview/.